A Diamond Select Toys release! What is the sound of one hand clapping? We don't know, because we need both hands to applaud this amazing statue of Daredevil! 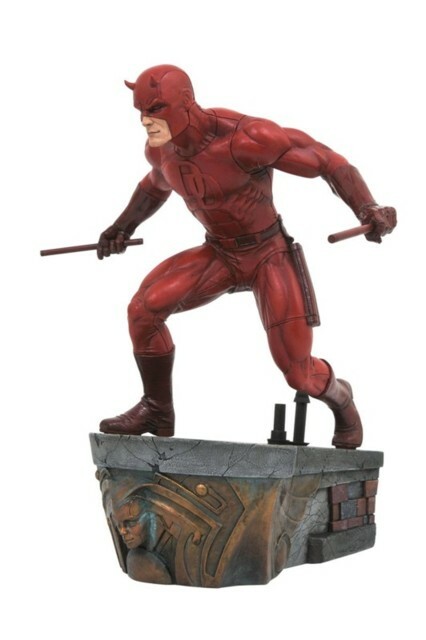 Hand-sculpted by Jean St. Jean based on a design by Caesar, this 12" scale statue of Matt Murdock's alter ego captures the vigilante overlooking the city streets with his batons in hand, the perfect embodiment of the watchful hometown hero. Limited to only 3,000 pieces, this statue comes packaged in a hand-numbered, full-color box with a certificate of authenticity. A must-have piece for any Daredevil fan!